I have no special category for the first thing I'm loving. What I'm looking forward to using? What I stalked the tracking order for this week? What I can't stop looking at? Who knows. As you can probably tell, I got a new agenda and if I fall into the black hole of raving about agendas, I think I will permanently fall in and never come out. 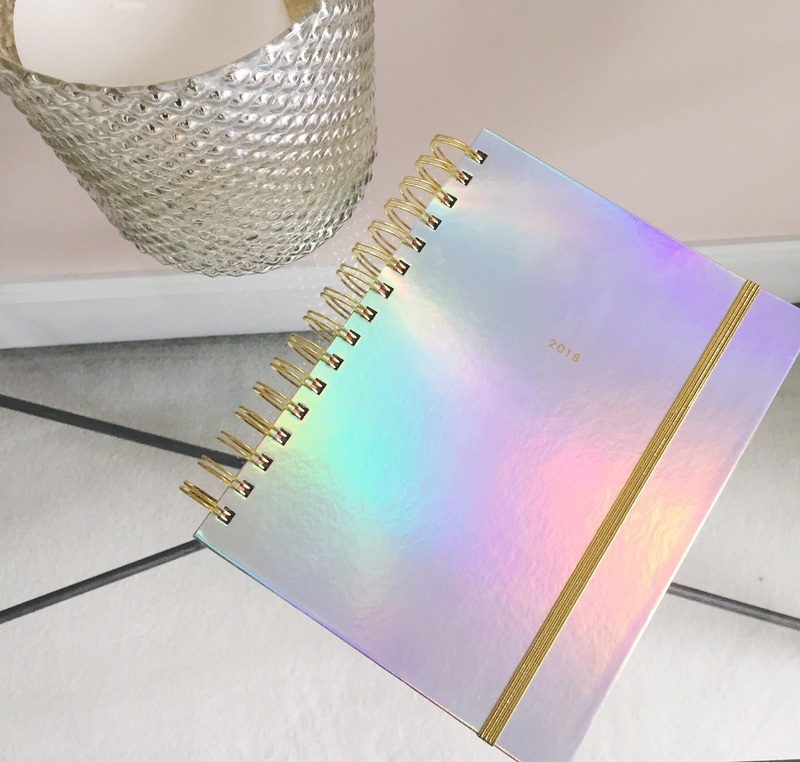 I got my 2018 Bando agenda in the medium sized with the holographic cover. I cannot stop playing with it. I stare at the cover and move it back and forth like I'm watching some sort of feature length film. It's going to be a major distraction, I just know it. I've accepted that fact now. Bando agendas are my all time favorite and my total jam at the moment. There were so many cute covers this year too that if I have to end up getting a second agenda, I might have to double up on Bando instead of choosing a different option for my next one. #Yikes. There's one song that I've had on repeat legitimately all week. "Back to You" by Louis Tomlinson and Bebe Rexha released early last Friday and I've had it on heavy rotation. I wasn't a massive fan of Tomlinson's debut single "Just Hold On" (not my favorite type of music, but the situation around its release makes me upset all over again), so I was quite nervous for the release of this song. And I gotta say...I'm in love. It's such a low-key bop, yet it still has that power to get stuck in your head. Very, very much enjoying that tune. My friend directed me to this song last week and I kept it saved in my songs on Spotify, but I've been really jamming to it lately. "Such a Boy" by Astrid S is just one of those songs you want to loosely sway to and swing your hair back and forth. I want to spend hours by the pool listening to this song. Speaking of by the pool, the "New Rules" video from Dua Lipa just recently released and it rekindled my love for the song post the release of her debut album. Y'all, if you aren't jamming to Dua Lipa yet, you gotta do it. I promise you won't be disappointed with your life choice. Still, a lot of nothing. I've been avoiding wearing makeup for a few reasons, really. Obviously, it's better for my skin to not have anything on it. But also I have nowhere to go that would require me to wear makeup so why waste my time and product on something that's not necessary? Really, on the rare days where I do wear makeup, it really just consists of this: foundation, concealer, setting powder, dusting of bronzer, blush, highlighter, mascara, tinted brow gel. It takes all but fifteen minutes to do, if that, and it gives me the coverage that makes me look like I'm a semi-functioning human in society. 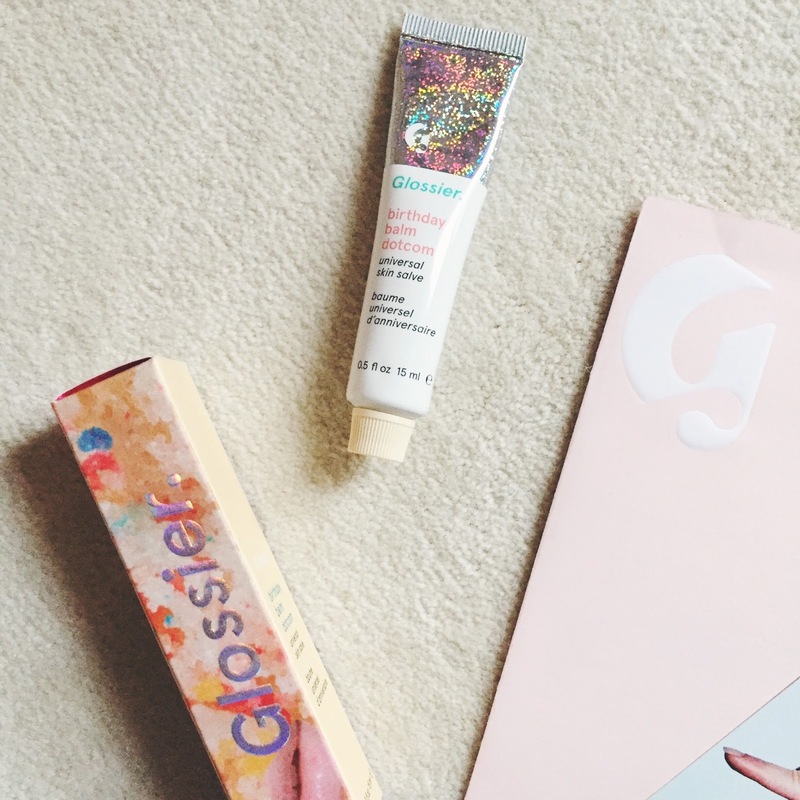 But, I will say, I just recently got my hands on Glossier's Birthday Balm Dot Com and I'm kind of totally in love. I'm not a chapstick person. I usually hate the feel of something so waxy and thick on my lips and always forget to put it on, mostly purposely though. Since I am a consumer of all things hyped though, seeing this product on Instagram a million and one times really made me too curious to pass it up. I was ordering a serum from Glossier anyways, so I popped this into my cart and I'm obsessed with putting it on. Most of it is because of the smell, I'm going to be completely honest. It smells like actual cake and it makes my sweet tooth go out of control. It does make my lips feel extremely nice and soft though, which is a problem I sometimes have during the summer because I'm out in the sun and my lips get dried out and a little burnt if I'm not careful. After six trillion years, I've finally done it. I've finally finished Gone Girl by Gillian Flynn. I seriously bought this book ages ago, like I'm talking at least three years ago if not longer. I lent it to my aunt who returned it to me about a year ago and I left it sitting on my shelf until the right moment came. Now, by this point, three years after the movie came out, I knew what happened. I've seen the "cool girl" monologue on Tumblr more times than I could count. And yet, I still devoured the book in a few days, repeating to myself "Everyone is crazy" a couple of hundred times. This book was wild from start to finish. I really applaud Gillian Flynn for writing such a twisted thriller (is thriller the right word? I found it thrilling). So much detail had to go into that, especially considering half of the first portion of the book was completely fabricated (I mean, the whole book is obviously fiction, but Amy's beginning diary portions are like...fiction within fiction). A wild ride indeed, but so, so, so good. I've heard SO much about Glossier, especially their Birthday Balm Dot Com. I think I'll have to check them out, and I have to read Gone Girl as well. I love well written thrillers, and the movie was great too! Omg your planner is so cute! I still need to get a 2018 one for myself haha. And I've been wanting to read Gone Girl forever, the movie is so good! !